KaBOOM! has a big announcement that merits and explosion of excitement. 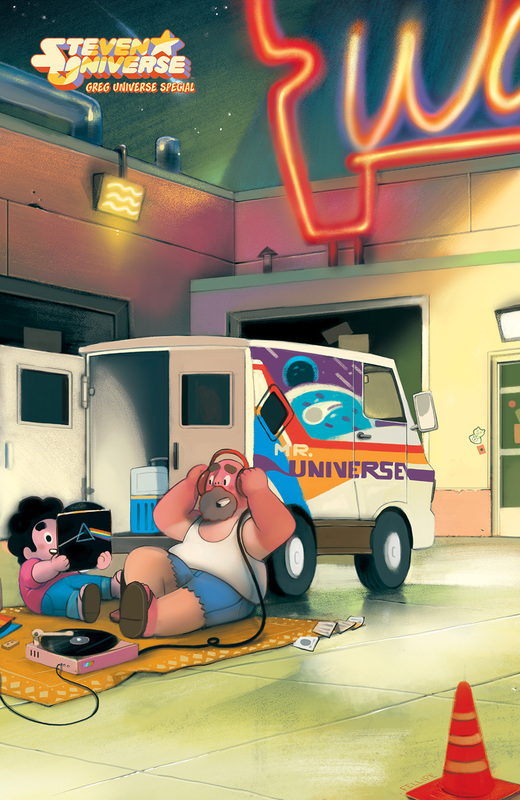 The publisher is using April to debut Steven Universe: Greg Universe Special #1 from a collection of talented creators, including Steven Universe creative team Jeremy Sorese and Coleman Engle, Liz Prince, Grace Kraft, Kelly Turnbull, Rachel Dukes and Chrystin Garland. Based on Cartoon Network’s hit original series, this oversized, self-contained issue features shorts centered around Greg Universe and his relationship with Steven. Steven Universe and the rest of the Crystal Gems are bonafide heroes, saving Beach City day after day. But you know who else is a hero? Greg Universe! 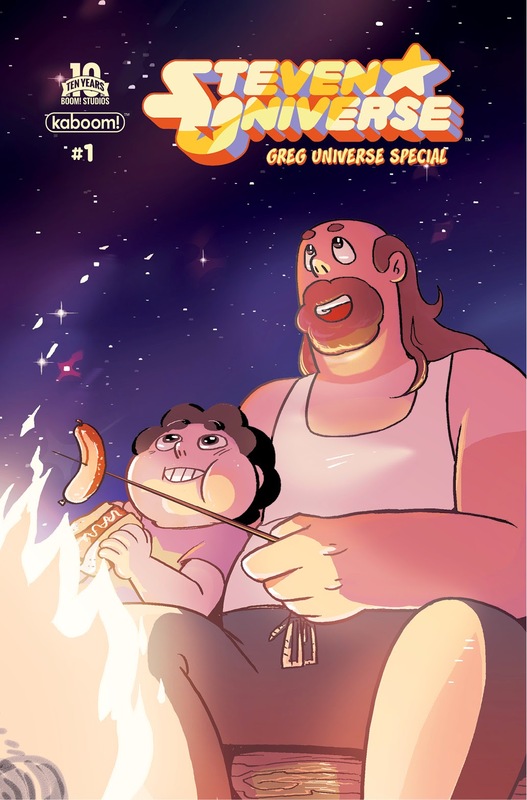 Steven Universe: Greg Universe Special #1 is a collection of shorts that features father-and-son fun, as Greg teaches Steven some valuable life lessons. Steven Universe: Greg Universe Special #1 arrives in comic shops on April 29th with a main cover by Ru Xu for the price of $4.99 under Diamond order code FEB151183. Also available in a limited quantity is a retailer incentive cover by Fellipe Martins. The Final Order Cutoff deadline for retailers is April 6th. April 2, 2015 (Los Angeles, Calif.) - KaBOOM!, the all-ages imprint of award-winning publisher BOOM! Studios, is excited to announce the April debut of Steven Universe: Greg Universe Special #1 from a collection of talented creators, including Steven Universe creative team Jeremy Sorese and Coleman Engle, Liz Prince (Tomboy), Grace Kraft (Steven Universe), Kelly Turnbull (Adventure Time), Rachel Dukes (Garfield), and Chrystin Garland (Bee & PuppyCat). Based on Cartoon Network’s hit original series, this oversized, self-contained issue features shorts centered around Greg Universe and his relationship with Steven. Steven Universe and the rest of the Crystal Gems are bonafide heroes, saving Beach City day after day. But you know who else is a hero? Greg Universe! Steven Universe: Greg Universe Special #1 is a collection of shorts that features father-and-son fun, as Greg teaches Steven some valuable life lessons. Steven Universe: Greg Universe Special #1 arrives in comic shops on April 29th with a main cover by Ru Xu (Steven Universe) for the price of $4.99 under Diamond order code FEB151183. Also available in a limited quantity is a retailer incentive cover by Fellipe Martins (Regular Show). The Final Order Cutoff deadline for retailers is April 6th. Not sure where to find your nearest comic retailer? Use comicshoplocator.com or findacomicshop.com to find one! It’s also available for order directly from boom-studios.com.